Not every project is the same, and that is why I love being an interior designer that specializes in everything from kitchens to whole home remodels, and working on projects that feature styles from contemporary, transitional to eclectic looks. For this project, I was hired by a family that was looking for me to create a game room for the whole family. Originally the upstairs area of their home had three smaller rooms that weren’t being utilized by the family. As part of the space planning process, I recommended that we remove all of the interior walls creating one large space and enlarge the window that faces out onto the backyard. This gave the family a whole new upstairs footprint that was now very usable space. High up on their list of requirements was a bar with a refrigerator, a sink, lots of storage, a television viewing area with comfortable seating, and a large area that could house game tables. This was a wonderful opportunity to be creative, as the family did not have a distinctive design style, nor did they know what direction they wanted for the look of the room. As the design process evolved, I learned that the family loves the outdoors and all of the colors of the outside. So my inspiration grew out of this family’s love for the outdoors. 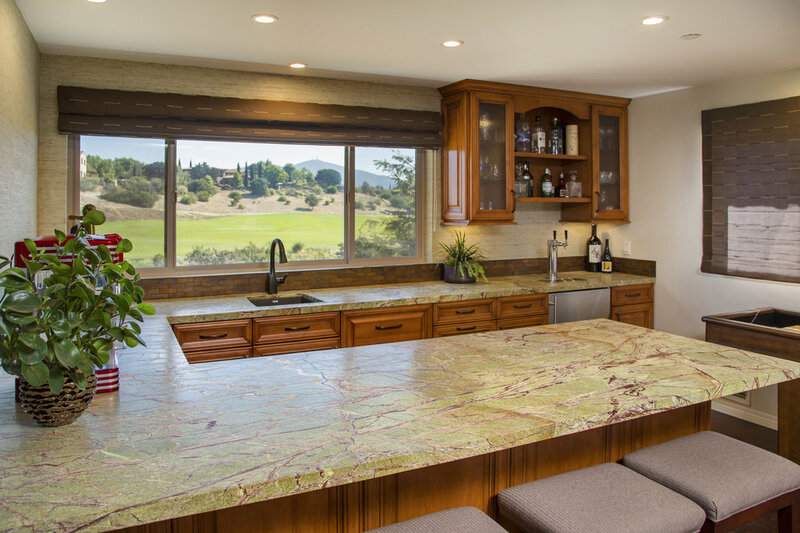 Knowing that the countertop was going to be a focal point of the room, I spent many days looking at different pieces of stones in slab yards until I found a beautiful stone that really picked up on the rich colors of the family’s backyard view. By incorporating this stone into the room as the focal point I was able to extend the picture postcard view from the large window in the room. The bar is a mini kitchen and features a sink, dishwasher, refrigerator, kegerator and plenty of storage. I designed and selected a rich, honey-colored natural wood cabinetry to compliment the unique counter top and then selected a copper backsplash to further reinforce the rustic look of the space. A warm green grass cloth wallpaper frames the picturesque window and helps to extend the rich colors of the green stone counter top. The wallpaper continues around the bar area and also covers the television viewing area. The warm, rich colors continue with the fabric that we selected for the comfortable bar stools and swivel chairs and recliners surrounding the seating area. The seating is comfortable with fabrics that further compliment the natural tones of the room. To ground the space, I selected a darker hand-scraped wood flooring. A few key gaming tables were brought into the space and were designed to coordinate with the rest of the room. This space is now the most popular room in the house. And is a gathering place for both adults and kids.